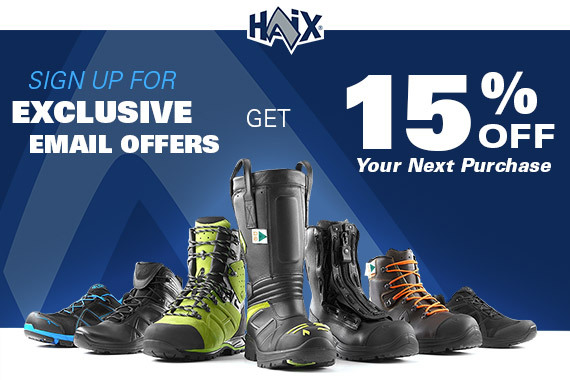 Product information "HAIX Black Eagle Safety 42 Low"
Looking for lightweight composite toe shoes, but aren't interested in a heavy-duty safety boot? The new HAIX® Black Eagle® Safety 42 Low comfortable safety shoe is our most flexible and lightest safety toe shoe yet. These slip-resistant shoes have an updated, modern design with black with blue elements, so you can be stylish, comfortable, and functional. Since your daily work can involve not only a lot of walking and/or lifting, you may be getting a pretty good workout in too. The athletic platform of this sport shoe, combined with the safety elements needed to keep you safe on the job, helps you to perform at your best day in and day out. Black Eagle® Safety 42 Low comfort safety shoe gives you a sneaker-like feel but maximum certified protection as well. This lightweight composite toe shoe incorporates all that you need in a comfortable safety shoe, including flexible, metal free puncture protection that is certified to ASTM and CAN/CSA. The protective toe cap is made of fiber reinforced plastic that passes the highest safety requirements, and the added rubber bumper on the outside gives some added abrasion resistant protection to the toe area, perfect when having to kneel while on the job. The highly breathable microfiber fabric combines with a GORETEX® Extended inner liner to make these lightweight composite toe shoe not only highly cool and breathable, but waterproof as well. Your feet will stay dry and comfortable all day long no matter how hard you sweat or what kind of day it might be outside, thanks to these comfortable safety shoes. The lightweight yet durable sole has anti-slip properties built in to keep you safely on your feet in different scenarios whether working inside or outside. Offering enhanced toe to heel support and a built in arch support system, these shoes are bound to keep you comfortable all day long. The sole also provides excellent thermal insulation, especially when standing on cold or warm surfaces. The outer sole has the added convenience of being non-marking, as well as resistant to heat, oil and gasoline. These oil resistant shoes also EH rated and certified. Our HAIX® Smart Lacing system allows you to lace up with a single pull. With these shoes you will never need to tie laces again, basically making this shoe more like a slip on. Your shoes will go on and off easily, a nice convenience to have after a long day on your feet. The low friction lacing offers perfect tension adjustments that can then be locked into place with the quick lock system. The bright blue laces can then be tucked inside the handy lace pocket on the top of the shoe. Out of warranty footwear can be refurbished with original factory parts through an extended wear package. This package includes any necessary replacement or repair of stitching, profiled rubber toe caps, insoles, and retreading of soles. Footwear will be cleaned and deodorized. HAIX® footwear owners also have the option of a sole retread only or a toe cap replacement only. Related links to "HAIX Black Eagle Safety 42 Low"
Customer reviews for "HAIX Black Eagle Safety 42 Low"
These shoes are great for work and off duty wear.. they're light weight and durable.